Iranian Maj.-Gen. Mohammad Baqeri met with his Iraqi counterpart and Syrian Defense Minister Ali Abdullah Ayyoub to discuss opposition to the US role in Syria on Monday. In what Iranian media called a "tripartite" meeting, the three held a joint press conference in Damascus. It is the latest visible sign of an Iran-Iraq-Syria entente that will aid Iran's ambitions in the region and comes on the heels of a historic visit by Iranian President Hassan Rouhani to Iraq. Syrian President Bashar Assad hosted the Iranians and Iraqis in Damascus to show off not only Syria's return to the region as a stable country after eight years of civil war, but also to stress that Iraq and Iran were now stronger allies of Syria than in the past. 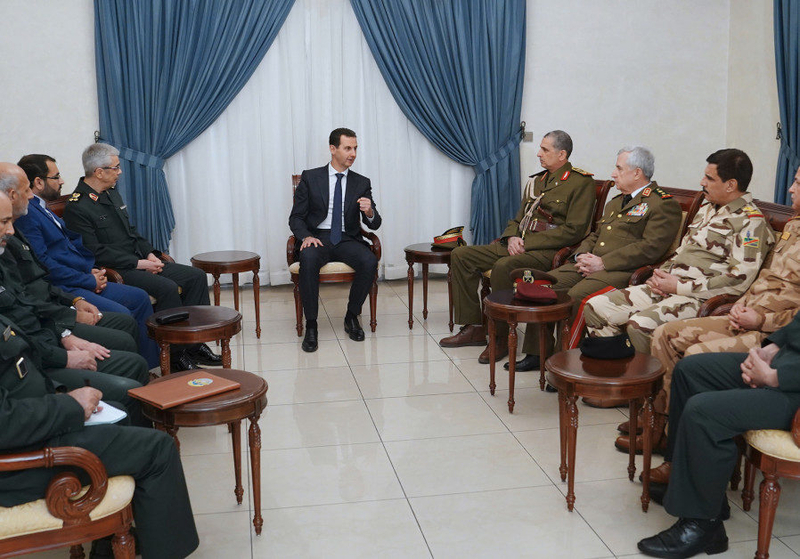 "We have shown our unity in this war and fighting together against enemies," Assad said, according to Iran's Tasnim news. In addition, the Iranians stressed that they want to pressure the US to leave Syria. Baqeri – acting as if he was in charge of Syria – stressed that uninvited "foreign forces" must leave the country. This is a reference to the US role in eastern Syria. He said that as long as the Syrian government asks Iran to continue to help it fight, the Iranians will stay. The goal is to "preserve national sovereignty and territorial integrity of Syria," and the three countries will continue to work to "defeat terrorists." This shows that now Iraq and Syria intend to work more closely along the border as well as in other areas. Threats are also aimed at the Syrian Democratic Forces, the main US partner in fighting ISIS. Ayyoub says Iran will return to eastern Syria either through military force or reconciliation agreements. This comes as the US indicates it may not withdraw from Syria and may maintain residual troop levels. The goal of Iran now will be to try to find a way to spread instability in eastern Syria, hoping to convince the US to leave. It also wants to pressure Iraq to call for US troops to leave Iraq.